Avid slots fans know that different types of slot machines have their own attractive qualities. Some love 3 reel classics for their simplicity. Others prefer the max-entertainment value of feature-rich video slots. It’s incredibly rare to see these qualities come together in a single game. Rare, but not unheard of. 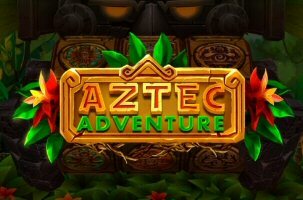 BF Games (formerly Bee Fee Games) is aiming to change that with the recent launch of the Aztec Adventure Slot. Being a smaller development company, the late-February release of Aztec Adventure didn’t make any big headlines. But now that the news it out, this unique title is definitely turning a few heads. Even on the surface, this new digital slot game grabs your attention as a unique addition. It’s not often we see so much attention to plot-thickening detail graphically embedded onto a classic 3 reel slot machine. HD quality imagery is standard these days, but generally less flamboyant as the creative team works to place the reels alongside the pay table; a traditional set-up that draws players who prefer the simplicity of a single-screen game/payout depiction. Aztec Adventure submerges players in the jungles of South American, utilizing rich runic symbols that paint the bygone picture of an ancient civilization. It takes a Sci-Fi turn with the employment of a life-like stone creature that holds and spins the rune-encrusted cylinder of reels. The 3D quality of the game comes to life with each win. The reels angle left to emphasize the animation of the payout. Aesthetics aside, where the new Aztec Adventure Slot really impresses is its range of features. Having a wild symbol isn’t all that uncommon in a 3-reel game, as this one does. Having a scatter symbol that begets free spins, on the other hand. That is virtually unheard of in a 3-reel slot machine! The game depicts a 3×3 reel set with 27 ways to win (all possible ways, left to right). Lining up any three matching symbols instigates a payout. Wilds replace all symbols except scatters, and 3 Wilds on a line delivers the highest pay of 1000 coins. 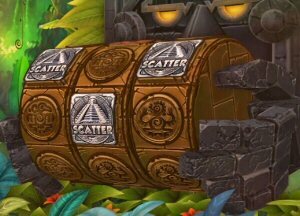 When 3 scatters appears across the reels, the player receives 15 free spins. This feature can be re-triggered if 3 more scatters appear during the original free games. If so, the player receives 15 additional free spins. During this feature, all round high-paying symbols appear stacked. If 9 matching symbols appear on all 9 positions of the reels, the payout receives a 3x multiplier. 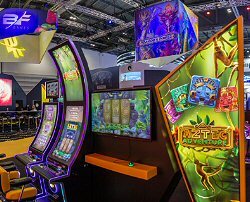 Aztec Adventure 3D, the physical cabinetry version of this digital slot title, was one of two titles BF Games chose to showcase at ICE Totally Gaming 2019 in London.